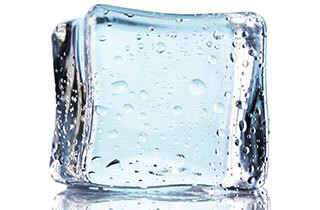 Cold compression is a combination of cryotherapy and intermittent pneumatic compression, and is a great modality for the treatment of pain and inflammation after surgical procedures. The benefit of cold: The primary reasons for using cryotherapy in acute surgical management is to reduce pain, swelling and tissue metabolism. Pain – Stimulating cold receptors effectively blocks out pain impulses attempting to access the spinal cord (Pain Gate Theory). The conduction rate of nerve fibres in a peripheral nerve fibre is also reduced by cooling and synaptic transmission can be delayed. This helps patient’s response to pain. Swelling – The swelling associated with the inflammatory response causes a pressure increase in the tissue and this leads to the area becoming more painful. This pain is intensified by certain chemicals that are released into the blood when the tissue is damaged. Although blood still flows into the area, the amount of swelling is significantly less when cold therapy is applied. Metabolic rate – Further to this, by lowering the temperature of the incision site, the cellular metabolic rate is reduced, facilitating tissue survival and reducing infection chances in the period following surgery. 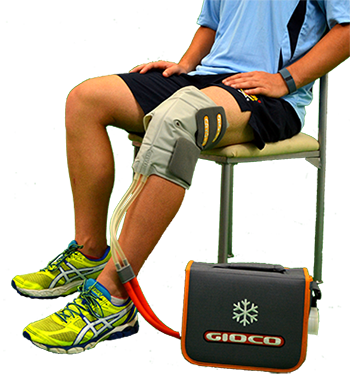 The benefit of compression: Ice with compression is significantly colder than ice alone due to improved skin contact and increased tissue density caused by extended static compression. The increased external pressure on the tissue also prevents oedema formation and venous stasis just as commonly prescribed compression stockings do. Impact on rehabilitation: By reducing pain temporarily through the mechanisms explained above, patients are more likely to participate in their physiotherapy program. For permanent pain relief, strength and mobilisation physio techniques need to be given during this period of transient pain relief. By limiting oedema through cryo-compression, more movement in the muscle is also facilitated lessening the functional loss associated post-surgery. Muscle strength is seen to diminish on cooling the limb due to its effect on viscosity and metabolic rate. But there is evidence to suggest strength increases over the original value about an hour or so after cooling has ceased. This has indications for maximising rehab outcomes. Our unit consists of a selection of wrap-around cold compression cuffs and a microprocessor controlled pump unit. The standard cycle is of 30 second duration (10 seconds compression, 20 seconds relaxation), but there are a number of different programs available including continuous cold compression if required. The unit provides safe and monitored therapy compared to other ice products due to its patented insert design and an on-screen warning set at 5 degrees Celsius to prevent burns. Overwhelming feedback has been the compact size of our device and its ease of use. Find out about our service model by clicking here and going to the drop-down information.